Uglyworld #367 - It's So Wild and Windy Today (59-365), originally uploaded by www.bazpics.com. The weather here today is a bit crazy, we've really high winds and there's rubbish, branches from trees etc all over the roads (the autobahn at lunchtime was running so slow due to all the crap in the way). Cinko has asked me if he could come back to mine this afternoon while Mireille is studying as he heard I picked up a couple of new games for the xbox360 while over in England last week. 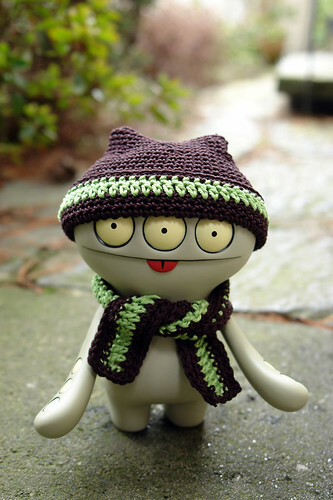 He was so happy that Mireille finished his "Choco & Minty" outfit during the week, which was such a perfect fit for him that he didn't even need to hold onto his hat while walking in the gale force winds. Uglyworld #365 - Happy Faces for Cinko, originally uploaded by www.bazpics.com. 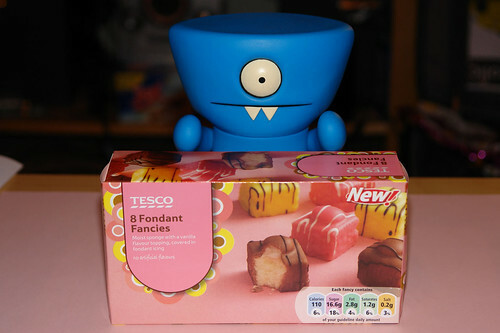 Uglyworld #364 - Fondant Fancies for Wedgehead, originally uploaded by www.bazpics.com. 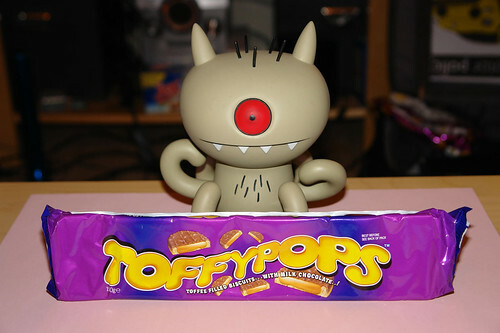 Uglyworld #363 - Toffypops for Target, originally uploaded by www.bazpics.com. 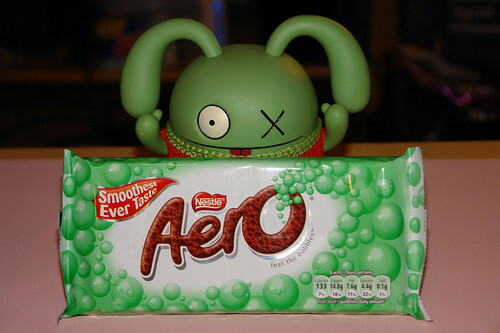 Uglyworld #362 - Mint Aero for Ox, originally uploaded by www.bazpics.com. 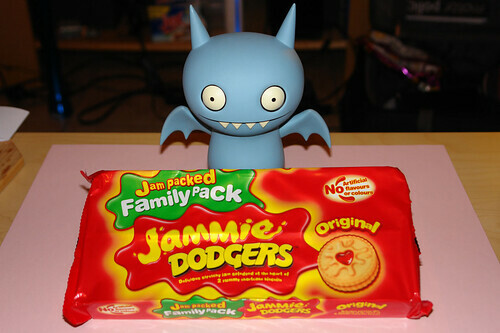 Uglyworld #361 - Jammie Dodgers for Ice-Bat, originally uploaded by www.bazpics.com. Uglyworld #360 - Strawberry Bonbons For The Happy Couple, originally uploaded by www.bazpics.com. 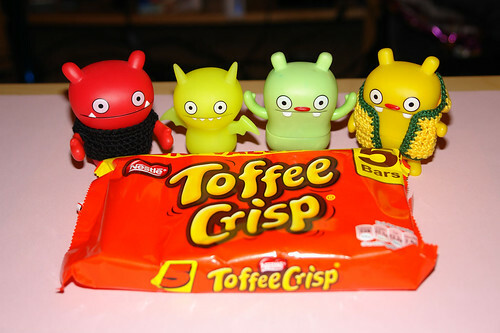 Uglyworld #359 - 5 Toffee Crisps To Share, originally uploaded by www.bazpics.com. Uglyworld #358 - Chocolate Eclairs for Babo, originally uploaded by www.bazpics.com. 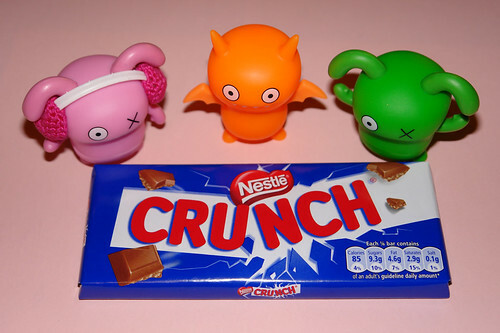 Uglyworld #357 - Nestle Crunch for Orange Ice-Bat and the Ox's, originally uploaded by www.bazpics.com. 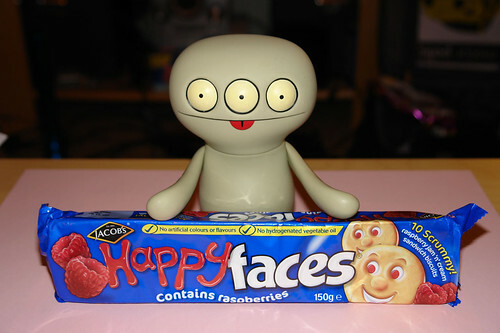 Uglyworld #356 - Babo Unpacks His Goodies From England (57-365), originally uploaded by www.bazpics.com. 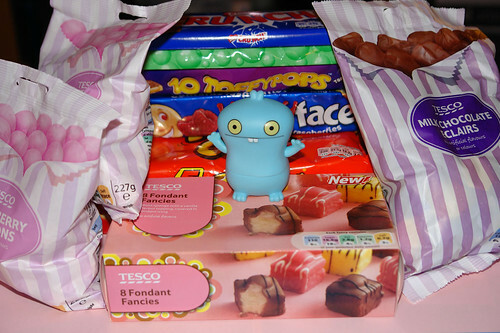 This morning Babo gladly posed beside the mountain of goodies that himself, Wedgehead and Jeero had bought with their combined total of 30 pounds before we left England to fly back to Germany. 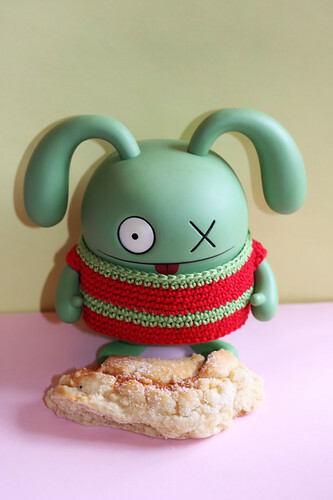 He tells me that he's already decided which uglies will get which chocolate/cookies, so I'll try and get some snaps of each of them with their presents later today too!!! 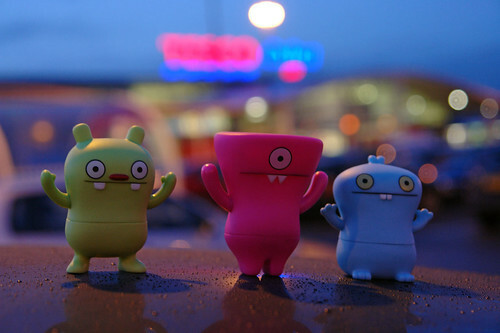 Uglyworld #355 - Jeero Wedgehead & Babo Prepare To Raid Tesco, originally uploaded by www.bazpics.com. 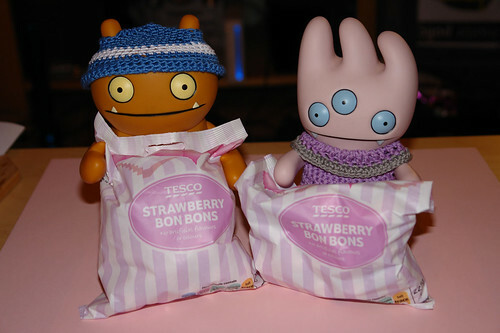 Wedgehead, Babo and Jeero were excited last night when we sat outside the local Tesco supermarket near the hotel we were staying at in Cambridge, England as they each had 10 pounds to spend on goodies to take back for the rest of the gang who were completely unaware of their plans back in Aachen. They're in the process of unpacking their case now, so hopefully they'll let me snap a pic in the morning of everything they acquired. Uglyworld #353 - Babo Plays Trivial Pursuit, originally uploaded by www.bazpics.com. Tonight is our last night in Cambridge so Babo asked if we could visit a restaurant he had heard of from some of my colleagues in the factory today. The restaurant was called the Golden Ball and was located only a couple of miles from our hotel and our English headquarters, but more importantly it soon became apparent why Babo wanted to go there so badly - they had Trivial Pursuit cards lying on every table in the restaurant. 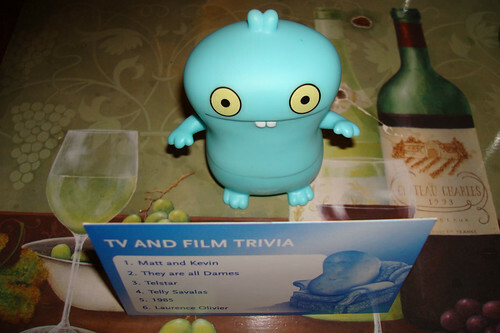 Babo couldn't work out why the rest of us could get all the questions correct, at least until we decided to put him out of his misery and explain that we could read the answers on the back of the card as it faced towards us while Babo read the questions which were on his side of the card. Uglyworld #352 - Wage Buys Himself a Mini (55-365), originally uploaded by www.bazpics.com. As you know Jeero picked up his trusty Golf GTI a few weeks ago and has been out on the autobahn with it on Sunday before myself, Wage, Ice-Bat and Babo travelled to Cambridge with my job for a few days. Last night Wage dragged us all along to a car auction as he said he had found himself "a minter", and amazing enough the little guy was correct - he had indeed found himself a mint example of a car, and the perfect car for him too as I'm sure you'll agree. This morning we decided to get up early and out into the daylight to have a real good look around Wage's new purchase, and it really is perfect in every way. Today he's going to drive me to work and then he said he may take a drive into Cambridge if it doesn't snow again like it was doing last night. Uglyworld #351 - Tree Climbing Is Fun (54-365), originally uploaded by www.bazpics.com. 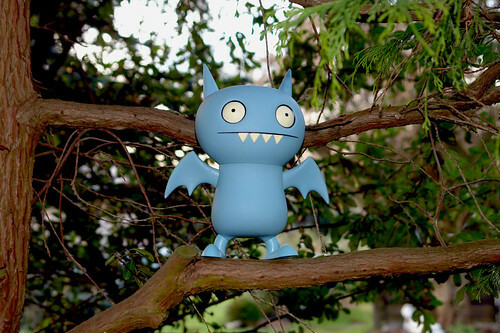 After arriving safely in Cambridge yesterday afternoon Ice-Bat has been so excited and has been asking if he can go to the University and listen to some professors giving lectures, which I've told him we can maybe do after I'm finished work one of the next 2 evenings. He decided to find himself something else to do in the meantime and seems to have found a new hobby, "I likes climbing trees". It does have one good point though, if he gets stuck up the tree he can simply fly back down again - no need for me to go find a ladder to help him back down again. In other news, Wage is heading to a car auction tonight to try and find himself a car. Uglyworld #350 - Wage & Tray Out For A Wee Stroll (53-365), originally uploaded by www.bazpics.com. Wage and Tray were up early this morning to go for a stroll before breakfast, the pair of them are so happy with each other at the moment (hopefully it stays this way also). Everytime you see them their either cuddling into each other, holding hands (they're getting sneaky at doing this around the other uglies) or staring into each others eyes. Makes for great photo opportunities!!! 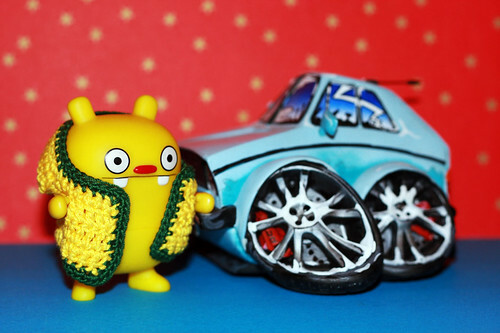 Uglyworld #349 - Jeero Gets To Drive His New Car, originally uploaded by www.bazpics.com. 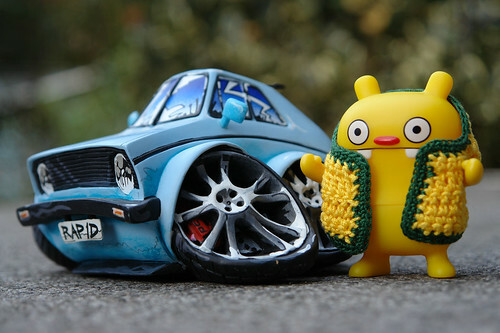 You can hopefully remember a few weeks ago that Jeero managed to save up enough money to buy himself a car, a Volkswagen Golf to be more precise. Due to the snow and ice which covered the roads for the last week or so I took the keys off of him so that he didn't call for help while hanging upside down in a field somewhere. As the weather was better today I decided to give him the keys so that he could take it out for a spin (I had to make him promise to clock up 30 minutes driving time behind the wheel before he'd take it out onto the autobahn). When he arrived back at the house several hours later he was still buzzing from driving his car, telling the other uglies tales of how he overtook a Porsche on the autobahn and the driver beeped his horn and waved at him. He's the coolest ugly on the block, for now (as Wage now has plans to try and acquire himself a car too while we're over in Cambridge, England from tomorrow through to Thursday). 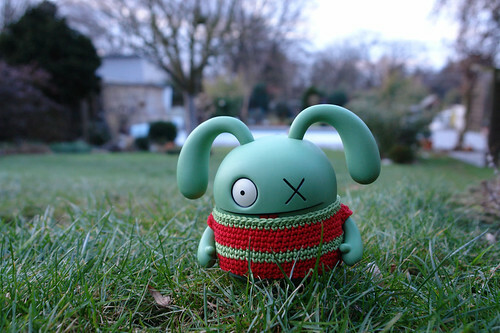 Uglyworld #348 - Ox Enjoying The Garden (52-365), originally uploaded by www.bazpics.com. Ox wanted to find out if Spring had officially arrived this morning and after an hour or so outside in the garden he returned to the house and stated, "No spring yet, winter is still here - maybe even more snow coming!. Uploaded by www.bazpics.com on 21 Feb 10, 10.34AM CET. Uglyworld #347 - Cappucino Targetted (51-365), originally uploaded by www.bazpics.com. This morning Target was looking extremely tired as he flopped from wandering along on his tentacles to the couch which he then collapsed onto. I asked him what was up to which he replied, "Another one of those crazy night, you know? ", so I can only imagine the little guys stayed up late last night and made their own little private party. Uglyworld #345 - I Have The Power (Ranger) (50-365), originally uploaded by www.bazpics.com. Ice-Bat has been looking for a young trainee at Uglyworld University to train in the ways of all things Ugly! Today he finally made his decision and chose a little trainee power ranger, and has literally taken him under his wing. I made the mistake of calling him a blue power ranger which he took quite some offense at - in his words he's the "Navy Power Ranger". Ice-Bat has been thinking all morning of a new slogan for his training camp, I offered to help him think of one but he semi-jokingly told me, "It's ok, I'll think of it, after all I do have 'the power' now". I look forward to seeing what he comes up with. Uglyworld #344 - Jeero Enjoying Aachen Karneval, originally uploaded by www.bazpics.com. 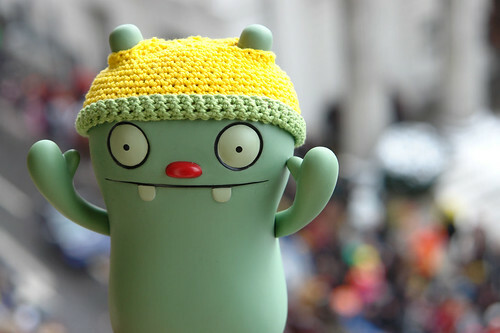 Earlier this week Jeero came with us to enjoy the Karneval parade in Aachen which this year boasted around 150 different floats of all shapes, sizes and colours. With me having been so busy all week with work I've had no time to sort out these pics yet (hopefully I'll get them uploaded over the coming weekend), anyway as a taster of what's to come here's a shot of Jeero screaming "Alaaf!!!" at the top of his lungs in order to try and score some chocolate from one of the passing karneval floats. 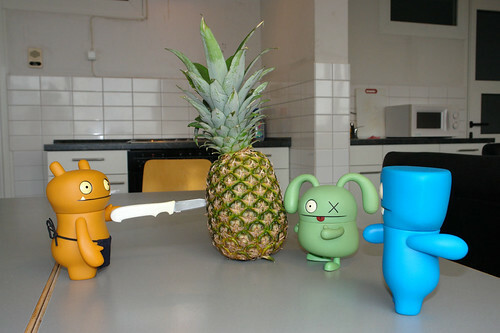 Uglyworld #343 - Jeero Joins Green-Peas (49-365), originally uploaded by www.bazpics.com. 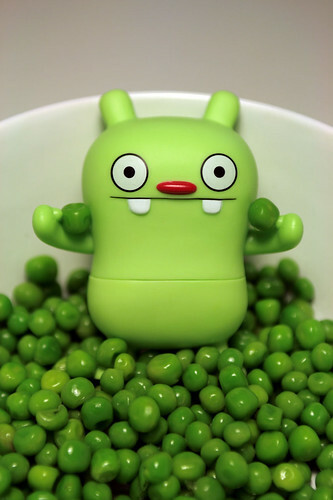 This morning when I woke up I strangely found Jeero lying in a bowl of peas, and had no idea at all why this was the case or what he wanted to achieve. He lay totally silent for about 25 minutes and then he decided to talk to myself and Mireille, "I'm here to save the planet, I've joined Green Peas, see!". It took a further 10 minutes for myself and Mireille to stop rolling on the floor with laughter, Jeero's lower interlect sure does provide some great laughter at times. Uglyworld #342 - Wedgehead Gets Interrogated (48-365), originally uploaded by www.bazpics.com. 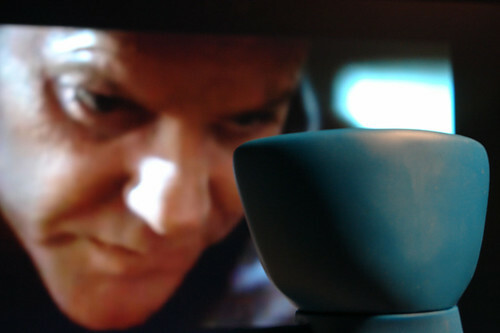 [Jack] I need 5 minutes along with this man, now! [Jack] Where are the cookies? [Wedgie] I couldn't tell you if I wanted to! [Jack] I know all about you and your other ugly friends, like young Cinko...I give you my word I won't rest until you're all brought to justice! It was crazy, but I can only assume the deal was made as Wedgehead's upstairs telling the other uglies about the interrogation just now, he thinks it was awesome but wished that Jack could have used his "don't fight it" line too. Uglyworld #341 - The Cool Home Made Radio (47-365), originally uploaded by www.bazpics.com. Jeeo wanted to go visit his good friend Guido today, I asked him why he wanted to go visit to which he replied, "Guido's so much fun, he has an amazing radio that he built himself as a kid, it's sooooo cool". 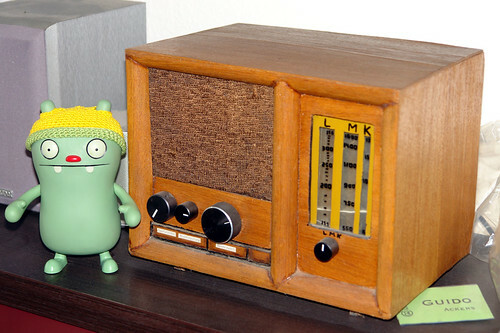 When I dropped him off I mentioned the radio to Guido and asked if I can grab a quick photo of Jeero with his favourite radio - just look at that smile on his face! Uglyworld #340 - Ox Tries His Hand At Snowboarding (46-365), originally uploaded by www.bazpics.com. After watching the winter olympics on television last night this morning Ox wanted to try his hand at some winter sports and after some deliberation he decided on Snowboarding. At the moment he's managed perfect 6.0's from all the judges, but only for perfect completion of a full head plant!!! Uglyworld #339 - Holding Hands, originally uploaded by www.bazpics.com. When Tray came downstairs this morning it was a little bit uneasy to say the least - none of the other Uglies knew anything about Wage's Uglytine card to Tray, but they could sense that something wasn't quite right at the same time. It was funny to sit and watch things develop as every so often Wage would steal a quick glance in the direction of Tray, and likewise Tray would do the same to Wage, but they never managed to do it at the same time. It's been snowing here pretty much all week, something Tray really enjoys to stand and watch so when she went outside to stand in the garden and watch the snow fall Wage finally made his move and sneaked out behind her. As she stood catching snowflakes on her hand and staring into the sky Wage quietly asked, "Is this space taken" while pointing to the patch of snow beside her. Tray replied, "Yes it is, or at least it's reserved....for you", at which point Wage moved in close and held her hand and they watched the snowflakes fall together. 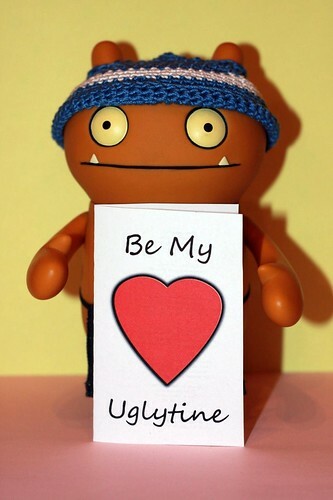 Happy Valentines Day everyone (especially from Wage and Tray)!!! Uglyworld #338 - Tray Receives A Valentines Card (45-365), originally uploaded by www.bazpics.com. I fall right at your feet! If I could be with you...!!! Tray stood there mesmerised by Wage's words, and all this time Wage was sitting downstairs silently in the living room wondering what Tray would make of his Uglytine card. Uglyworld #337 - Be My Uglytine, originally uploaded by www.bazpics.com. Wage asked me earlier this evening if I had any coloured pencils and pens that he could borrow. 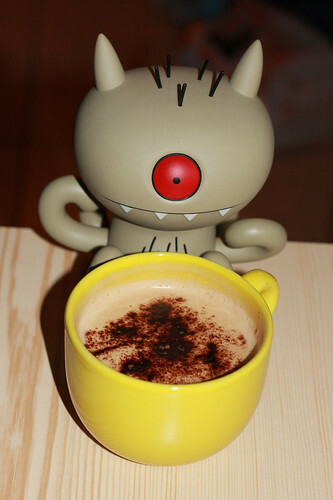 At first I didn't think too much about it as it's quite often that Wage or one of the other Uglydolls would want to borrow them to draw pictures or write funny stories to each other, but when Wage scurried off to his bedroom with a sneaky look on his face I was rather intrigued. I decided to stay downstairs in front of the TV and see how long it would take for him to come back out of his bedroom, but almost 5 hours later I decided that I had better go check on him (it was getting serious as he didn't come down to play "pass the cookie" which Babo, Cinko and Ox were playing). As I opened the door to his bedroom he feverishly tried to hide a piece of paper, so I quickly stepped into the room and closed the door behind me. Wage was looking very embarassed but managed to say, "If I shows you what I has been makings, you must keeps it a secret ok?". I nodded my head at the same time as saying yes to his question. He still wasn't satisfied that I would keep whatever it was he was hiding to myself and added, "promise???". I told him his secret was safe with me and he then brought the paper from behind his back - he had made an awesome valentines card. I asked him who it was for, but this was one question he wasn't willing to answer directly and instead said, "it's for my Uglytine, maybes you see tomorrow, maybes you dont". Uglyworld #336 - Babo Bags A Berliner, originally uploaded by www.bazpics.com. 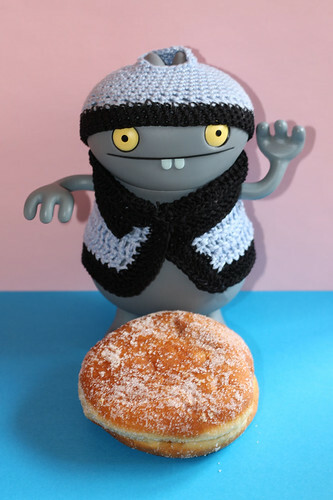 And with only Big Babo being left to decide before the bag was empty he was over the moon to find that his favourite food from the bakery awaited him - a Berliner!!! Uglyworld #335 - Ox Prefers Streuselbrotchen, originally uploaded by www.bazpics.com. With the small Babo's already having eaten their rolls with scrambled egg earlier it left the rest of the contents we bought this morning at the bakery to be divided up between the other guys. 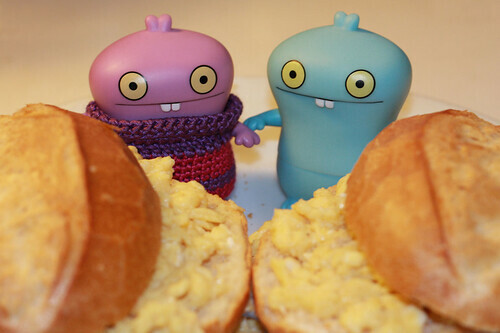 Uglyworld #334 - Rolls With Scrambled Egg For Breakfast (44-365), originally uploaded by www.bazpics.com. When it comes to deciding what we're going to make for breakfast there's always one thing that's already written in stone. When it comes to the small Babos there's nothing they like more than having a load of piping hot scrambled egg on a nice fresh crusty roll. To demonstrate the point I had to shoot this picture in the 1.3 nanoseconds in between the plate of rolls and scrambled egg landing on the table and the pair of them nose-diving into their dedicated breakfast roll. Uglyworld #333 - There's A Cowboy In Our Bed (43-365), originally uploaded by www.bazpics.com. For Fettdonnerstag Mireille went to work dressed up as a cowboy and had quite a copious amount of sekt (champagne) and beer throughout the morning, afternoon and into the evening when I picked her up around 8pm. It's always fun to hear her randomness at these times and it gives me and all the little guys a good laugh too. This morning Plush Babo, Wedghead, Wage and Ox all wanted their picture taken beside the cowboy who was sleeping in the bed (there was a strict no guns in the bed rule, but hats were deemed ok after a brief discussion at gun point). Uglyworld #332 - Wedgehead Celebrates Fettdonnerstag (42-365), originally uploaded by www.bazpics.com. Karneval season actually kicks off in Germany on the 11th of the 11th (November) at 11:11, but the grand parades take place this coming Monday (Rosenmontag) before the Karneval season draws to a close for another year on Wednesday (Ash Wednesday). 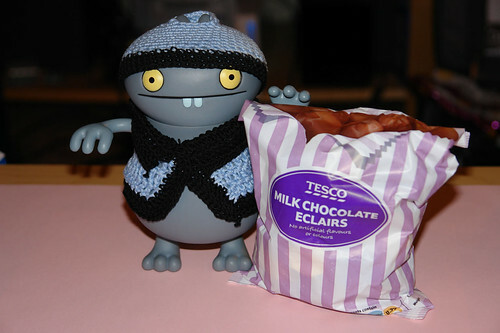 Wedgehead decided that it would be a good idea to take some chocolate out with him today, in the event some "crazy women" tried to attack him he could then fend them off with chocolatey treats. I'm not quite sure it will work, but hey - we all love a trier!!! Uglyworld #331 - Check Out My New Car (41-365), originally uploaded by www.bazpics.com. 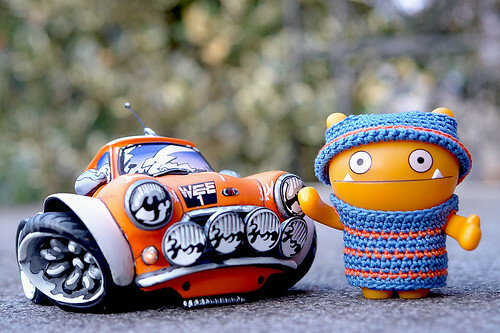 Today is quite an exciting day as Jeero who has been working in the local cookie factory finally saved up enough money to put a deposit down on a car last week, and this morning it arrived. As you can imagine he's ever so slightly buzzing, unfortunately it's been snowing here again so I've put a temporary stop on him heading out to drive it for now. Does he look happy? Oh hell yeah! Uglyworld #330 - This Is Why You Don't Let Jeero Near Gadgets (40-365), originally uploaded by www.bazpics.com. 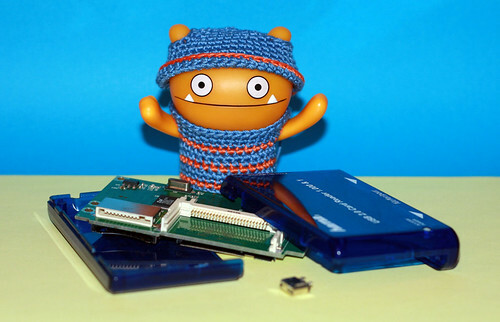 Wage knew nothing of Jeero attempting to try and fix the card reader we use to download all of our pics onto the PC from, so you can just imagine his reaction when he discovered the "aftermath of Jeero" as he later called it. 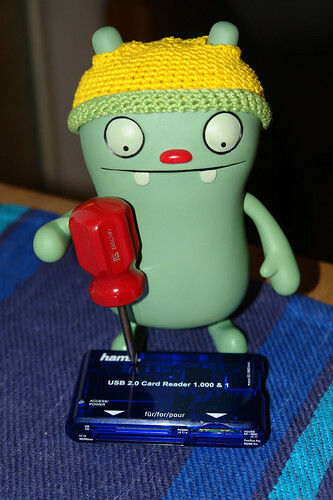 I think it's safe to say that this particular card reader is never going to work again now, so looks like I'll have to buy a new one (and keep Jeero away from it). Wage was rather upset at not being able to download his pics right away, and kept strutting around tutting to himself and swinging his arms about in the air. 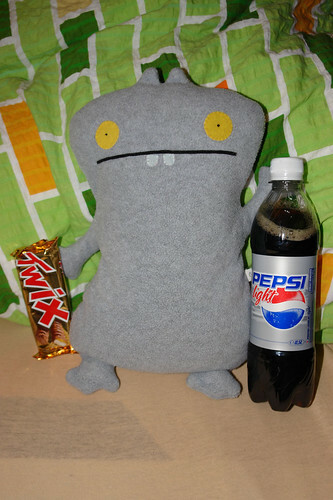 Jeero was unavailable for comment. Uglyworld #329 - I Can Fix It (39-365), originally uploaded by www.bazpics.com. 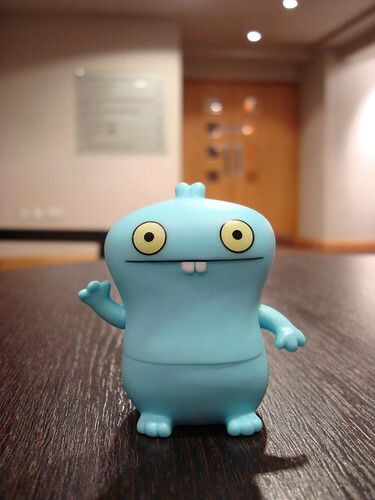 Jeero heard me going mad at my card reader biting the bullet last week, and then again this morning as I often need it for work to copy files from various components of the machines my company makes. 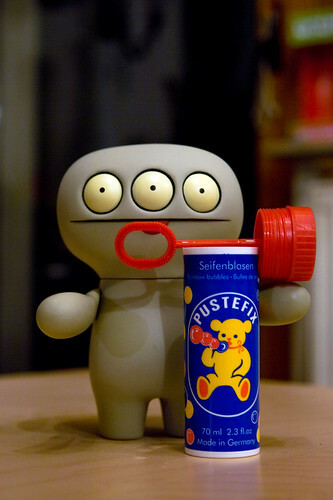 Jeero offered his help (I wasn't quite sure how this would pan out but I said yes anyway) and he raided my toolbox for something suitable. Uglyworld #327 - Learning To Ice-Skate, originally uploaded by www.bazpics.com. Ever since Cinko came to watch myself and Mireille Ice-Skating a few weeks ago he's been wanting to give it a try for himself, but with him being the youngster of the Ugly bunch we were a little worried about his first time on the ice being at the crowded Ice Rink in Aachen. We wondered whether or not we could find somewhere local for him to get his first real feel for how it is to stand on ice and skate around, but this morning Tray had already taken the initiative and Cinko was out standing on the frozen surface of the swimming pool. I went down to the bottom of the garden to see how he was getting on, of course as soon as Cinko saw me standing watching his concentration went and he ended up sitting on his bum. Tray was managing to keep her cool with the little guy while explaining how to keep his balance (with poor Cinko slipping and sliding around every so often). It was so funny to watch his face so I ran in to grab the camera so the rest of you could share in the fun (he said he's going to skate all day with Tray's help - don't worry I'll be sure to call him in for a nice hot lunch and dinner to break up the day skating around. I just hope he doesn't bite his tongue when he falls! Uglyworld #326 - I'm Forever Blowing Bubbles (36-365), originally uploaded by www.bazpics.com. Cinko heard that I had to make a quick trip to our local supermarket and asked me if he could come along (he likes to ride in the basket and trolleys). He always refers to himself as the offical "stuff watcher", and in return for him doing this job he's always allowed to pick something for himself. Today's choice, bubbles which he's been playing with ever since we got back to the house, he's even humming and singing along to the tune of "I'm forever blowing bubbles". Normally he's not allowed to blow bubbles in the house, but today we've decided to make an exception. Uglyworld #325 - I'm Away To The Library (35-365), originally uploaded by www.bazpics.com. This morning Tray was up at the same time as me and appeared to be in an extremely jolly mood, so I decided to ask her (1) Why she was already awake?, and (2) Why she was in such a happy mood? Tray told me that she wanted to expand her knowledge today and as such was going to go the library and read some books, and maybe even take some notes. She was all dressed in the new dress which Mireille made for her around christmas time, and had her little bag filled with pens, paper and a cool pink highlighter. Uglyworld #324 - Name That Tune (34/365), originally uploaded by www.bazpics.com. With it only being a few hours now until we leave Freiburg and drive North to Aachen (hopefully not through too much snow) the guys decided to play a game amongst themselves while I packed our cases (I always get all the good jobs as you can see). Ice-Bat had noticed that I packed my Ipod before leaving Aachen and asked if he could borrow it until it was time to leave, I was intrigued to find out why exactly he wanted it so I checked on them once I had finished packing. 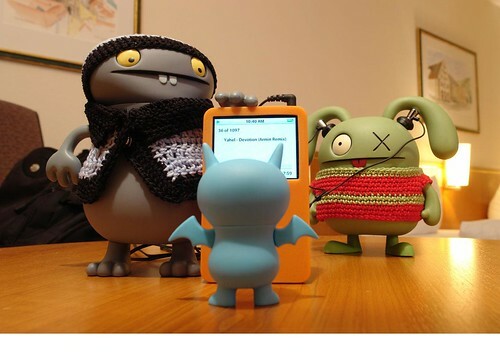 It turns out that Ice-Bat had the idea to play a game of "name that tune" with Babo and Ox, with Ox being the one wearing the headphones and having to guess the song selected by Ice-Bat on the Ipod (which was being held by Babo to prevent Ox being able to look at the screen). Ice-Bat would let the song play for the first 30 seconds and then pause it, Ox then had 10 seconds to name the tune for 10 points, after which Ice-Bat would play a further 10 seconds for 5 points and then the rest of the song which was only worth 1 point. Ox didn't do too badly according to Babo - 3 perfect 10's, 6 fives and 1 single pointer out of the 10 songs selected by Ice-Bat. They didn't get time to swap sides as I was ready to check out of the hotel so they had to keep round 2 for the next time. Uglyworld #323 - Just Powdering My Nose (33/365), originally uploaded by www.bazpics.com. This morning I woke up and lay in bed for a little while before deciding it was time to get up. When I finally got out of bed I was surprised to see the light in the bathroom was already on from the small gap underneath the door, so I knocked on the door and asked if anyone was in. 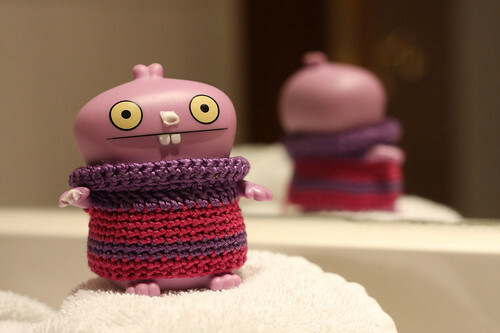 "Is only me, purple Babo" came the reply, so I asked how long she was going to be, to which she replied "Two minutes, I'm just powdering my nose", which got me thinking - Does Babo actually have a nose?